he masthead of the Irish Worker incorporated idealized depictions of Irish men and women at their labours. We are often told that labour leader Jim Larkin was against drinking, one of the main leisure pursuits of working-class Irish people, but little is said about his attitude or that of the wider labour movement to cinema. At least in terms of sheer chronology, the rise of the Irish labour movement paralleled the rise of cinema, with a burst of activity in the late 1890s, followed by a major resurgence in the early 1910s. What did labour leaders think about the cinema, this developing cultural institution that seemed so attractive to workers? During the 1913 Lockout, labour leaders did not see cinema as a medium of agitation, an accessible way of disseminating their ideas. They did, of course, use popular media to agitate, educate and organize, but the popular agitational medium of choice was the press. Nevertheless, the references to cinema in the Irish Worker, the newspaper edited by Larkin from 1911 to early 1914, indicate that people in the labour movement were thinking about the new visual medium. Most of these references suggest that they thought about cinema in fairly straightforward ways. It was a source of income in the guise of the advertisements for the Irish Cinema in Dublin’s Capel Street, the only ads for an entertainment venue that appeared in the paper on a regular basis. It was the occasion of a parody of prominent opponents of radical labour – including Independent newspaper proprietor William Martin Murphy and picture-house owners who were also members of Dublin Corporation, J. J. Farrell and Lorcan Sherlock, the then Lord Mayor – who were said to have attended a special screening of Dante’s Inferno at the Camden Picture House on 10 February 1913 (“Farrell’s Inferno”). Beginning on 22 September, the film would have another week’s run at the Camden, accompanied by a special orchestra. And it was a new type of workplace where the more equitable worker-employer relations being demanded elsewhere also had to be fought for, as they would be when the Theatre de Luxe – another Camden Street picture house – was picketed in late September 1913 following a worker’s dismissal for union activity. 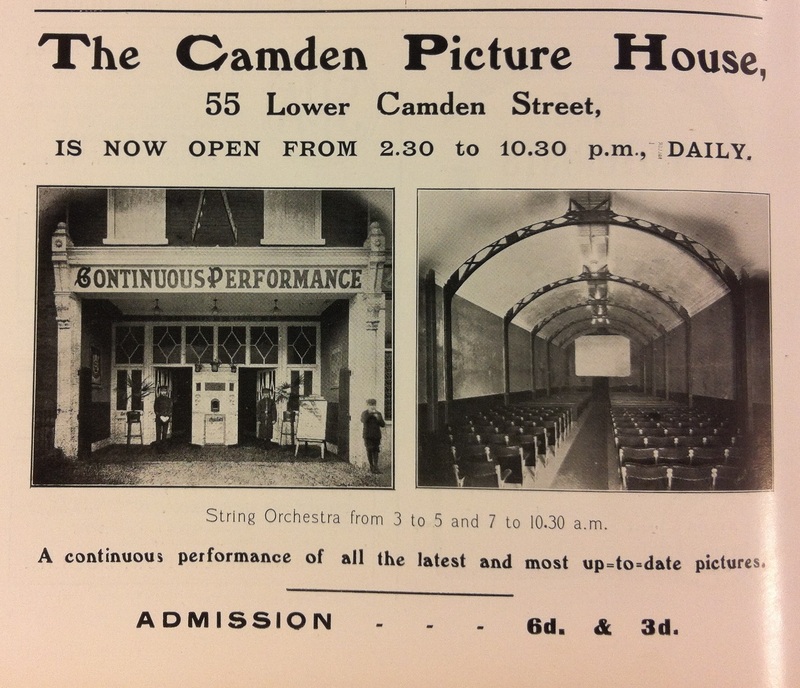 An ad for the Camden Picture House in December 1912, showing both its streetfront – with doormen, plants, and cashbox – and auditorium. The purpose of “The Flictoflicker Girl,” however, is much less straightforward. This short story was written by “Mac,” a pseudonym of Andrew Patrick Wilson, who also frequently contributed to the Irish Worker as “Euchan.” Scottish-born Wilson was active in Delia Larkin’s Irish Workers’ Dramatic Group, and he later managed the Abbey before returning to make significant contributions to Scottish theatre and film (“Who Fears to Wear the Blood Red Badge?”). “The Flictoflicker Girl” appeared on page one of the Worker on 23 August, just a few days before the tram strike that precipitated the Lockout, sharing the front page with articles reviewing George Edwardes’ Gipsy Love, a musical comedy playing at the Gaiety Theatre (Euchan), and analyzing the use of the term “respectability” as a way denigrating trade unionists (Shellback). Both of these articles drew out the immediate political implications of popular culture and language for Dublin workers. The extraordinary focus on culture in this issue suggests that the union was offering workers a Horse Show Week special in all but name. “The Flictoflicker Girl” was more oblique in its cultural critique than the accompanying articles. It tells the story of Charlie Payne, who falls in love with the screen image of Daphne Wildrew, the (fictional) Flictoflicker company’s leading lady. When he sees a film in which she gets married and is then abused by her husband, he is first consumed by jealousy and then so overcome by a range of emotions that he has to leave the picture house before the film is over and catch an early tram home. He is flabbergasted to find that the only other occupant of the carriage is Daphne who is “over for local scenes,” but he s traumatized again when she takes his declaration of love as a joke and is met at her stop with a kiss by the dastard from the film. The story is fascinating for many reasons, but it is particularly intriguing as a unique source of information about the reception of cinema in Ireland at this early point in its institutional development. It addresses its readers – working-class trade unionists – as more sophisticated picture-house patrons than Charlie Payne, whose flight from the city-centre picture house to the suburbs marks him out as middle class and whose foolish fascination with the screen is not excused by youth; an opening paragraph carefully ages him to “that hazy period when men cease to be regarded as eligible and have not yet secured the comfort and dignity of being described as old bachelors.” However, like Charlie, who “never went to theatres, and music halls were places he detested,” readers are assumed to share his “distinct liking for picture palaces,” at least to the extent that they must have a good knowledge of what goes on there to understand the story. Perhaps his connoisseurship, his love of Westerns produced by the Flictoflicker Company, is laughable, yet it was doubtless more so for readers who know that films were already highly codified into genres – of which the Western was the most popular; “no picture programme nowadays is considered complete if it does not include a cowboy film,” as a reviewer in the Dublin Evening Mail commented (“Rotunda Pictures” 9 Sep. 1913) – and that branding by production companies was well established. Similarly, Charlie’s infatuation with the Flictoflicker Girl would have been topical for readers familiar with the crazes for the Biograph Girl and the Vitagraph Girl, actresses only later famous under their own names Florence Lawrence and Florence Turner, respectively. Indeed, a month after “The Flictoflicker Girl” was published, the Rotunda Pictures broke “new ground as far as Dublin picture houses are concerned” by beginning to show the city’s first film serial, the 12-part Edison serial What Happened to Mary, starring Mary Fuller (“Rotunda Pictures” 23 Sep. 1913). “[A]ll who have seen the opening scenes of Mary’s adventures,” the Dublin Evening Mail reviewer commented, “will be eager to know more about this fascinating actress” (“Rotunda Pictures” 27 Sep. 1913). It is likely, however, that many of the workers who had read Mac’s story in August would have been unable to afford to sit fascinated by Mary Fuller at the Rotunda screen in late September 1913. Euchan. “The Love of Ronance.” Irish Worker 23 Aug. 1913: 1. “Farrell’s Inferno.” Irish Worker 15 Feb. 1913: 3. Mac. “The Flictoflicker Girl.” Irish Worker 23 Aug. 1913: 1. “Rotunda Pictures.” Dublin Evening Mail 27 Sep. 1913: 3. Shellback. “The Value of Respectability.” Irish Worker 23 Aug. 1913: 1. “Who Fears to Wear the Blood Red Badge?” Irish Times 11 Sep. 2013. This entry was posted in Andrew Patrick Wilson, Audience, Camden Street Picture House, Dante's Inferno (Italy: Milano 1911), Dublin Lockout, Film stars, Florence Lawrence, Florence Turner, Irish Cinema (Dublin), Jim Larkin, John J. Farrell, Mary Fuller, Theatre de Luxe, What Happened to Mary (US: Edison 1912) and tagged Film and fiction, Short story, Workers Demonstration by EarlyIrishCinema. Bookmark the permalink. An incredible blog you have here! If you be interested in guest posting on CURNBLOG (something on a handful of early Irish films, perhaps) please let me know! Thanks for the kind words, James. I’d be happy to do something with you; maybe the importance of The Story of the Kelly Gang to early Irish cinema might be a point of common interest? Fantastic! That sounds perfect – a hugely important film not just for Australia and Ireland but for cinema in general. I’m looking forward to it! I’m entirely flexible in terms of timelines, so I’ll leave that to your convenience. It would be great to get some details about yourself with the article so I can help promote your efforts and your blog! Thanks Jetta. I look forward to your next visit.